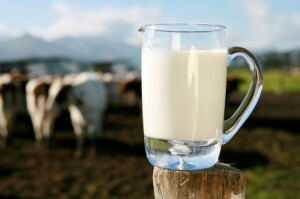 What Makes Organic Milk Organic? There are four requirements that the U.S. Department of Agriculture has established in order for a product to be labeled USDA Organic Milk. Here are the four requirements and a brief look at the arguments for and against each requirement. One requirement is that the cows are not treated with antibiotics. In non-organic milk production if a cow needs antibiotics it is treated and then returned to the herd once tests show that it is antibiotic free. If a cow in an organic herd needs to be treated with antibiotics, it is not allowed to return to the herd for 12 months. In addition organic milk cows must have access to pasture. Currently the standards do not require a specific length of time for the cows to be allowed access to a pasture. There is some controversy surrounding the practices of a few organic milk producers not allowing enough pasture time for their herds. Another requirement of organic milk is that the cows cannot be treated with BGH – bovine growth hormone, which increases milk production. People feel this is important because there is concern that BGH hormones in milk could lead to higher levels of IGF – insulin growth factor – which is linked with cancer and that it could raise the risk of other hormone-related cancers. Others say that BGH is harmless. The reason is that BGH is a protein hormone, which means that if some does appear in milk, our digestive track destroy it. In addition our bodies naturally produce some IGF each day. High levels of IGF are most often associated with being overweight, and consuming diets high in saturated fat and refined calories, not milk consumption. Organic herds can only be fed grain or grass that is not treated with pesticides. Again it is stated that the small levels of pesticides in non-organic milk are safe and do not pose health risks.Grain and grass fed cows are healthy cows. MY REACTION I choose to drink organic milk even if many say that it is not worth the extra cost. Why? For the reasons stated above. I love milk and I am trying to fuel my body with only the highest quality foods, in my mind that means organic foods and organic dairy whenever possible. You will have to decide if the processes listed above provide enough value for you to justify the additional cost of organic milk. Some researchers say that organic milk generally contains less saturated fat and more good healthy fatty acids than milk produced at intensive commercial dairy farms. Some experts say to drink raw, non-homogenized whole milk from grass-fed cows only. Some experts say it is fine to drink uht (Ultra High Temperature or Ultra Heat Treatment) milk, uht extend the shelf life of milk, while some say don`t… I know, who can you trust? Regular milk vs. organic milk the choice is yours on this site we want to provide you with as much helpful information as possible.